You see a lot of glassy looking logos and designs around these days. Buttons or titles are made to look like they are smooth curved glass. I think it started with Mac OS X. Anyway, It's a pretty cool look so here's a way for you to make your own glassy buttons or other design elements. For a less detailed glass effect that is much quicker and easier, see my instaglass tip. Begin by defining the shape of your glass in a new channel. Rounded corners help create the smooth curved glassy look. In 2.4 this is easy. Select the rectangle selection tool, check "Rounded corners" in the tool options, and select an appropriate radius (I used	about 15). You could also just create a new channel and paint your shape on it with white. 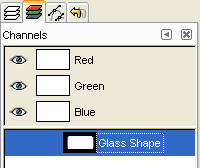 Create a new transparent layer called "Glass" and do Channel to Selection on your glass shape. 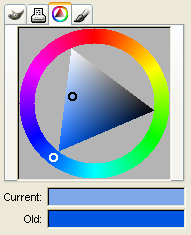 Select the color you want for your glass and a lighter shade of that color as your foreground and background colors. Gradient fill the selection so that the lighter shade is at the bottom and it transitions to the full color about half way up. Create a new layer on top called "Glint" and fill it with white. Set the opacity for the layer to about 75%. Add a layer mask to it with full transparency. Shrink the selection by about 5 pixels (or about 5% of the glass's overall size). In the layer mask, gradient fill the selection from white at the very top down to black just a few pixels lower. 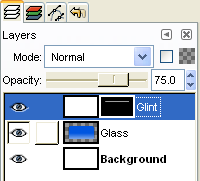 Add a layer between "Glass" and "Glint" with whatever you want to appear on the surface of the glass. I added some text, but it could be an image or icon, or whatever. This result looks pretty good. You can stop here if you want, but I'm going to add a few more touches to really make it look good. Add a new transparent layer just above "Glass" and call it "Edge". Do Channel to Selection again and then Select|Invert. Back in the new layer fill this area with black. Select|None (Ctrl-Shift-A) then Filters|Blur|Gaussian Blur by about 10 (depending on how big your image is, of course). Add a layer mask to this layer with full transparency. Channel to Selection again and in the layer mask fill with white. Set the opacity for the layer to about 75%. 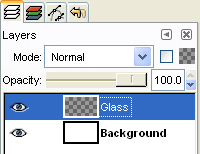 Add a new transparent layer between the background and the "Glass" layer. Call this layer "Shadow". Channel to Selection again and fill that area on the new layer with black. Select|None (Ctrl-Shift-A) and Filters|Blur|Gaussian Blur by about 5. Move the "Shadow" layer down and to the right a bit and then set its opacity to around 40%. There you go! Beautiful glassworks from your computer.